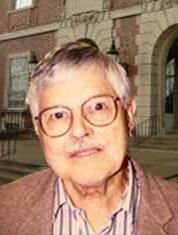 Professor Emeritus of Physics Cameron B. Satterthwaite died on May 28, 2011, at his home in Clark Lindsey Village, Urbana, IL. Satterthwaite was born in Salem, OH, on July 26, 1920, to William David and Mabel Cameron Satterthwaite. He graduated from Olney Friends School, a Quaker boarding school in Barnesville, Ohio, in 1938. He received his bachelor’s degree in chemistry from the College of Wooster in 1942. His graduate training at The Ohio State University was interrupted by World War II; he worked on the Manhattan District Project in Dayton, OH. He received his doctorate in chemistry from the University of Pittsburgh in 1951. On December 23, 1950, he married Helen Foster of Pittsburgh. She survives. Satterthwaite worked as a research scientist at Monsanto Chemical Company from 1944 to 1947, at DuPont from 1950 to 1953, where he authored two patents on the production of synthetic fibers, and at Westinghouse from 1953 to 1961, where he first undertook low-temperature physics experimental work. His achievements in superconductivity research at Westinghouse led to an invitation to join Physics Illinois in 1961 as an associate professor; he was promoted to professor in 1962. At Illinois, Satterthwaite and his group made fundamental contributions to our understanding of the metal hydrides, including the discovery of superconductivity in thorium hydride. His measurement of thermal conductivity in aluminum was an early test of BCS theory. In 1979, Satterthwaite took early retirement from the University of Illinois to become chair of the physics department at Virginia Commonwealth University, Richmond, Virginia, a position that he held from 1979 to 1985. Satterthwaite had a lifelong interest in politics and government. In 1968, he chaired the Federation of American Scientists and testified before both the Republican and Democratic platform committees to advocate for an antiballistic-missile treaty. He served as a delegate to the 1968, 1972, and 2000 Democratic National Conventions.